Air admittance valves are used to provided venting for soil and ventilating stacks - most types are for installation within a building, others are specifically designed for outside use. 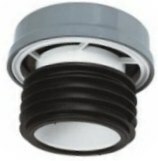 Those installed internally are generally fitted within rooms or the roof space. One great advantage of using air admittance valves internally is that they remove the need for holes through the roof or external walls. 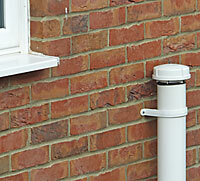 Their use also reduce the amount of pipework needed to fit an external, open soil or ventilating stack. Air admittance valves used externally are specifically designed to operate within specified environmental conditions which must be checked against the intended installation location. The main advantage in using air admittance valves externally is that they reduce the amount of pipework which would otherwise be necessary to take the stack opening sufficient far from any window or other opening in the building. Unless an air admittance valves is specifically described as being for external use, it should only be installed internally. The air admittance valve incorporates a sealing diaphragm which under its own weight or slight spring pressure is normally held closed, thus sealing the foul air within the pipework - see diagram right. When an appliance discharges into the drain, a slight negative air pressure is produced in the drain pipework which lifts the sealing diaphragm and allows air to be drawn in - see right lower. This intake of air equalises the air pressure and the sealing diaphragm falls back sealing the valve. The inrush of air through the open valve prevents the foul air in the pipe from escaping into the room/roof space and prevents the water seals in traps along the pipework from being broken. An air admittance valve must be installed so that it is positioned above the highest flood level of the appliances fitted to the pipe - that is to say, where a washbasin is connected to the pipework, the air admittance valve must be higher than the overflow of that basin. This is to ensure the correct operation of the air admittance valve, otherwise there is a risk that the water seal in the basin's trap may be broken. The use of air admittance valves are governed by building regulations (Part H) and they cannot be used in all situation, these regulations should be checked before specifying the use of an air admittance valve - generally speaking, within a normal, two storey house with an existing vent pipe, there will be no problem; fitting within a taller building or a block of flats may be problematic. Air admittance valves are easy to fit, some incorporate seal rings which seal against the inside of the pipework, other valves just slip onto the top of the vertical pipe. They can only be fitted to vertical pipework - turning the valve on its side will mean that the seal won't work. They should only be fitted within a building to avoid the risk of them freezing during winter frosts. Most air admittance vales are supplied with a formed polystyrene moulding, which should be fitted to the valve top after installation in an unheated roof space to provide added protection from frost. Problems can arise where air admittance valves are fitted to vent pipes which are not separately vented and which include water traps - this can lead to back pressure in the pipework when an appliance is discharged which will effect the appliance discharge - this will be especially noticeable when a toilet is flushed. Air admittance valves do not need any maintenance but can cause problems if they become faulty as they may allow sewer gas into the building.